Teachers and pupils are picked up at the airport by the school staff.
. They are joined by their hosts.
. Pupils spend the afternoon with their hosts. 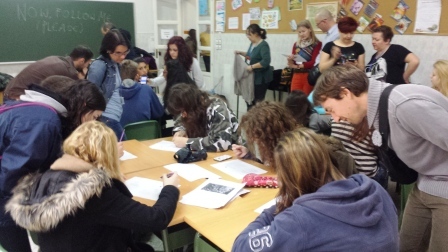 09.00- 10.00 Presentation of the meeting in Madrid ( Spanish Team and Headteacher). Distribution of pupils in international teams. 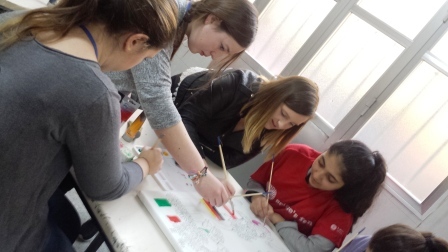 10.00-13.30 Visit to the historical heart of Madrid: “Habsburg Madrid an literary Madrid” in connection with the topics of the eTwinning project Ready, Steady, Slow. 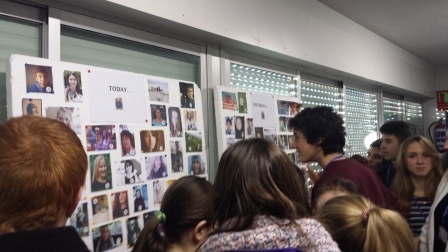 15.30- 17.30 Pupils´ presentations on Biological Time- Pupils´workshops in connection with the topics of the eTwinning project Ready, Steady, Slow. 08.00 Meeting at the school. Distribution of tasks for the pupils in international teams. 08.30-11.00 Pupils´ workshops. Teachers´project meeting at school. 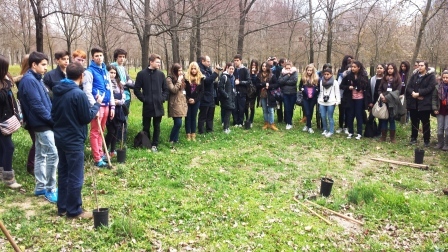 11.00- 11.30 Planting of the Comenius tree: another sapling is planted by each team. All those trees will be part of “ The Wood of Joy” which will remind future pupils of the cooperation of our schools and symbolize our common European citizenship (in connection with the topics of the eTwinning project Ready, Steady, Slow). 14.30- 15.30 1 hour shopping in the “Principe Pío” shopping area. 19.00- 22.00 “Time” party at school. 08.30 Meeting at the school. Organization of the groups for the attendance of an-hour lesson at Colegio Cristo Rey. 09.00-10.00 Guests- divided in groups- attend a class. 12.00-14.00 Visit to the Royal Botanical Gardens of Madrid: Flowers and trees in Spain and the European Union (in connection with the topics of the eTwinning project Ready, Steady, Slow). 14.00- 14.45 Lunch (picnic) at Retiro Park. Ready, steady, grow slow - III H Feb. 2015 from gabriella pastore on Vimeo.